Can We See an Atom? In this article I will discuss how these images are made, what exactly we are looking at, and what it really means to see an atom. The answer to the titular question really depends on what we mean by “see.” We see something when light emitted or reflected from an object reaches our eyes and the signal is conducted to our brain. The naked human eye has a resolution of about 100 microns. Atoms are separated by roughly a tenth of a nanometer, and we can barely see a mote of dust that is a million atoms wide. So in this sense, no we can not see an atom. But what if we use a magnifying glass? What if we use a microscope or a telescope? An electron microscope? Where do we draw the line of what it means to see something? For the purposes of this article, I draw the line at visible frequency passive optics: lenses and mirrors. If a microscope is converting light to electrical signals, or collecting data for longer than the human eye can, or the signal is being amplified digitally, or light is not being used at all, we are no longer seeing the object we are looking at, we are seeing what a computer screen is showing us. 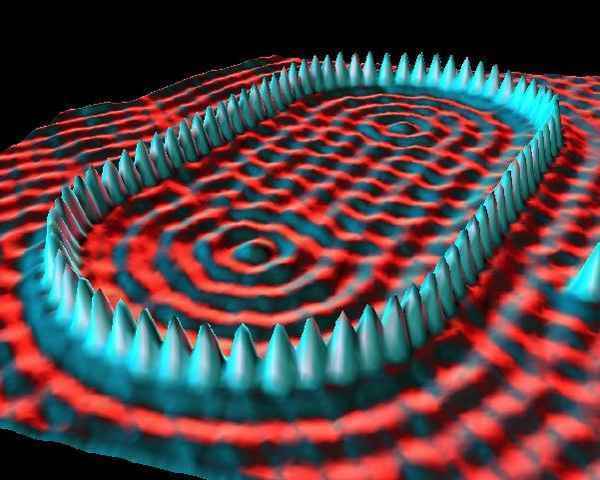 So with our naked eyes we cannot see atoms, and looking through any light microscope we also cannot, because even the best lenses and mirrors cannot beat the diffraction limit, which is roughly half a wavelength, about 200 nanometers, or 1000-2000 atoms. If materials existed that could refract x-rays like glass refracts visible light, we could maybe make an x-ray microscope, but those materials don’t exist. Our eyes cannot see atoms, but what can? The electron microscope images we usually see are from scanning electron microscopes (SEMs), which bounces a beam of electrons off a sample coated with metal. These do not have atomic resolution. Transmission electron microscopes (TEMs) send a beam of electrons through a sample, and the electrons are detected on the other side. If SEMs are like a medical ultrasound, TEMs are like an x-ray. 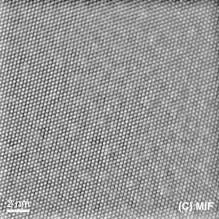 The same TEM image of a nanoparticle, shown above. A simple way to interpret a TEM image is that where there is something brighter in the image, there was less stuff blocking the electrons. So if the resolution is high enough, and you see something like this, rather than seeing atoms in a plane, you are likely seeing the projected shadow of a column of atoms, rather than the shadow of an individual atom. The bright spots on the image are regions where there are fewer atoms blocking the electrons. This is not quite how TEM imaging works, the electrons must be re-focused after going through the sample. The technology has improved over the years, and now it is possible perform TEM on single-layer graphene and see the atomic structure from a sheet of carbon, which I think is pretty impressive. An atomic force microscope (AFM) is not an electron microscope, it is an example of a scanning probe microscope. Basically, it is a little platform (often big enough to see, like a few millimeters), with a very very small tip on the end. The platform and tip are dragged across a surface and a laser beam is reflected off the surface of the platform, and deflections in the platform deflect the beam, which can be recorded. Left. Schematic of AFM operation. Midde: SEM image of an AFM cantilever and tip (source). Right: I’m not sure why this image exists but I wanted to include it (source). There are two main ways that these operate. One is by having the platform vibrating up and down at the resonance frequency of the platform, called tapping mode. When something interacts with the tip, the frequency of the platform changes, and this is recorded. The other just keeps the tip at a constant height, and measures the deflection of the platform as the tip is lifted by objects on the surface. Everything is better as a GIF. Source. 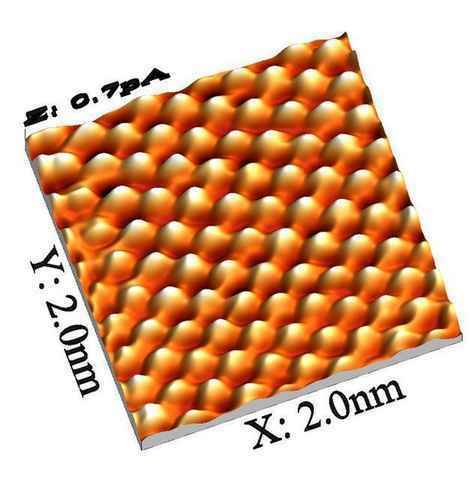 The resolution of an AFM is basically determined by how sharp the tip is, and with a tip that truncates with a single atom, one can have atomic resolution. So the way these images are made, is by scanning an extremely sharp tip across a surface and measuring at each point either the force exerted on the tip, or the height of the surface. 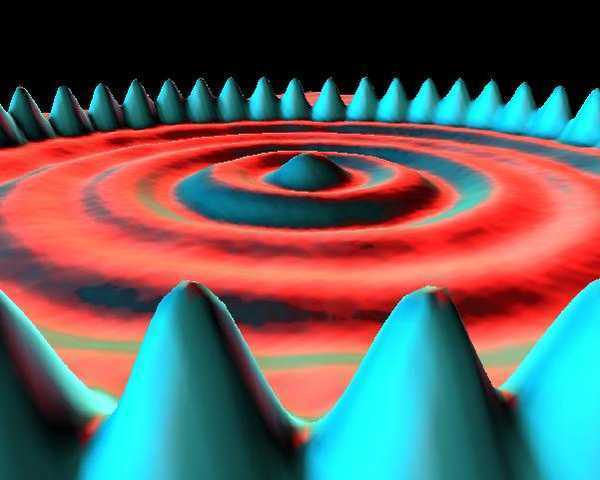 The measurements can be fine enough to detect surface deflections caused by single atoms. The tip generally scans in a straight line, then moves over slightly and scans again. On an atomically flat surface, each line looks like a zig-zag pattern, and putting these together you get a 2D image (which you can 3D render if you want). 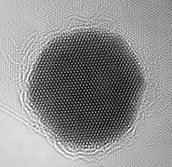 2 nm square image of the heights of atoms across a plane. Source. This is the method that was used to image the organic molecule shown at the beginning of this article. It requires not only a very sharp tip, but also hours and hours of extremely slow scanning. Very impressive. Another example of a scanning probe microscope, the scanning tunneling microscope (STM) looks similar to an AFM except instead of measuring the deflection of the tip, it shoots electrons out of the tip. The electrons are bound to the atoms in the tip, but a voltage is applied between the tip and the surface, making the electrons likelier to quantum tunnel from the tip to the surface. Instead of measuring height, the STM measures how likely at each point the electron is to tunnel (technically, the local density of states). STM images are the most likely to be excessively 3D rendered by their creators, making it look like someone is holding a camera right next to an atom and taking a picture with flash. I have a feeling this is because IBM invented the technique in the 1980s. 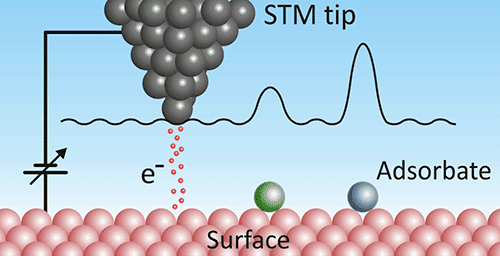 One cool thing about STM is that the tunneling probability depends on the electron density of the surface, so you can actually visualize the wavefunction of the unbound surface electrons, in the images. IBM’s A Boy and his Atom. The surface of a platinum tip. The different rosettes of atoms are different crystal planes. Source. One of the oldest techniques that could image with atomic resolution, field emission microscopy involves applying a massive voltage (thousands of volts) between a tungsten tip and a screen. The electrons start flying out of the tip, and follow the non-uniform electric field and hit the screen, where their position is noted and back-tracked to figure out where on the tip it came from. This can be used to ascertain the position of each atom in the tip. A voltage is applied between the tip and the screen. Electrons fly off the tip, follow the electric field, and are back-tracked to determine the atomic organization of the tip. 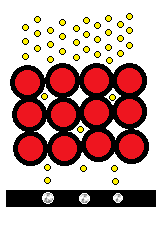 There are other variants, including field ion microscopy, where atoms are adsorbed onto the tip and then flung off (rather than electrons), and atom probe tomography, which is a destructive technique that involves applying sufficient voltage to a sample that the individual atoms start flying off. Atomic imaging: Now in 3D! 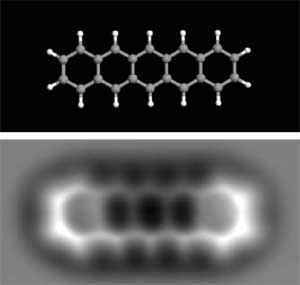 These techniques generally rely on locating the positions of atoms in a plane and then rendering them so that people can see where the atoms are. There are a few methods, however, that can image the 3D positions of atoms. The aforementioned Atom Probe Tomography is an example: as each atom flies off the sample, its original position can ascertained, and a 3D image of each atom’s location can be built up. It can also distinguish different elements. However, it is generally limited to things that are small and shaped like a narrow cone. I recently saw a video produced by Nature talking about a paper that effectively combined TEM with computed tomography (CT) imaging. They took a 2D TEM image of a nanoparticle at different angles, and combined all the data to obtain a 3D map of the 27,000 atoms in the particle. I thought it was pretty cool. We can’t see atoms with our eyes, or with anything that enhances our eyes, but we can figure out the positions of atoms and render those in a way that we can see. https://www.physicsforums.com/insights/wp-content/uploads/2015/09/atoms.png 135 240 Alex Klotz https://www.physicsforums.com/insights/wp-content/uploads/2019/02/Physics_Forums_Insights_logo.png Alex Klotz2015-09-28 14:04:532019-02-04 14:22:26Can We See an Atom? I've seen many of these "atom" photos online. Nice to get some explanations! Thank You for this really nice article !! Very interesting. But I'm confused with the image just below the text that reads: "The technology has improved over the years, and now it is possible perform TEM on single-layer graphene and see the atomic structure from a sheet of carbon, which I think is pretty impressive." This illustration pretty clearly shows carbon atoms as *light* spots, not dark spots. 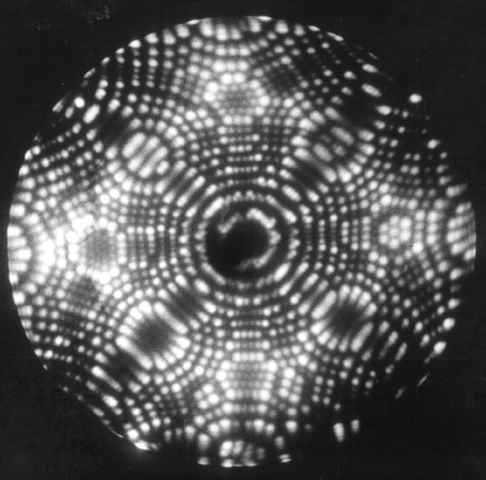 But the caption to the immediately previous image reads: "The bright spots on the image are regions where there are fewer atoms blocking the electrons. 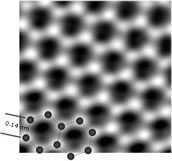 "In a TEM image, are the atoms bright, or are they dark? it depends whether they're dark field or bright field image.